Laurie Constantino is the editor, publisher, and primary writer of laurieconstantino.com. From time to time, guest posts written by interns or other contributors appear on the site; these posts include a byline properly crediting the author. If no byline appears, the post was written by Laurie. Have you ever been stopped at customs with 30 pounds of cheese in your suitcase? 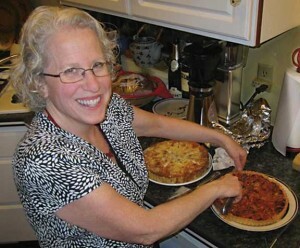 It’s a regular occurrence for Laurie Constantino, a passionate home cook, and her husband, Steven. Each year the pair travel between their homes in Anchorage, Alaska’s largest city, and Limnos, a rural Greek island in the northern Aegean Sea. Laurie’s love affair with Mediterranean cooking began 30 years ago when she met Steven, a Greek-American, in Bethel, a remote Eskimo community, where she was working as the District Attorney. In 1987, Laurie and Steven traded the windswept tundra of Bethel for the sun-bleached beaches of Limnos to live in the home they inherited from Steven’s grandmother. There, Laurie learned Greek by cooking with her new relatives and shopping in tiny supermarkets and market gardens. After a year centered around the kitchen, it was as if she’d completed a comprehensive course in traditional Greek food and cooking. 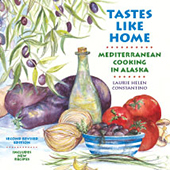 In 2007, Laurie’s book Tastes Like Home: Mediterranean Cooking In Alaska, containing 182 fully-tested recipes, was published; a revised edition adding new recipes came out in 2011. The recipes are for authentic Mediterranean fare using ingredients readily available in Alaska and throughout the United States. Also in 2007, Laurie started her blog, Mediterranean Cooking in Alaska, selected by Saveur Magazine as Best of the Web/Site We Love. Today, Laurie dishes up Mediterranean home cooking inspired by her travels, and her collection of 3500 cookbooks, and writes about it at www.laurieconstantino.com. 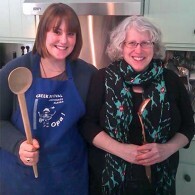 She also teaches classes on wild edible plants, foraging for wild mushrooms, and Greek/Mediterranean cooking. Jennifer McGovern’s love of food began in her hometown of Haines, Alaska. Fresh Alaskan seafood and berries were frequently on the menu. It wasn’t unusual for someone to drop off Dungeness crab or fresh caught salmon at the door. Jen remembers picking wild blueberries and raspberries with her mother for hours and hours. A dietitian, Jen earned her degree from Oregon State University. Her love of food is second to her love of family; she has three children and a military husband, who are her joy and inspiration. 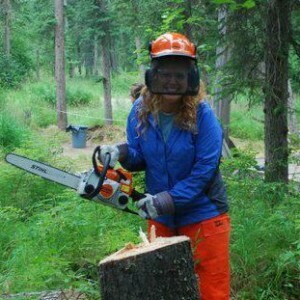 Jen’s other interests include jogging, canning and preserving, berry picking, and eating all the great food Alaska has to offer.